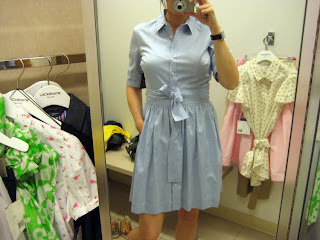 I rarely do dresses, but have been looking for the perfect shirt dress for ages. Most are too flimsy, or short, or don't fit me right. 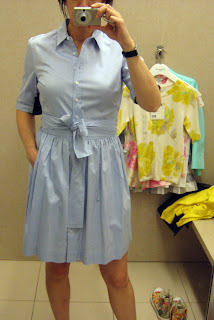 This, however, is what all shirt dresses should be: well fitting, appropriate for work, and not totally dull. 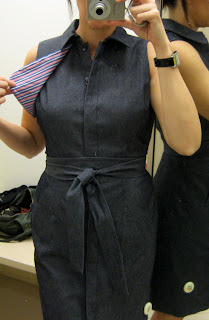 Only problem is my sad bow tying skills, but I do love that this dress gives a girl a big sash to play with. The third floor dressing rooms in Macy's Herald Square. Broadway side, baby, because this is from Isaac Mizrahi's first Liz Claiborne collection, a spring cornucopia of colors and brightness. Go in depressed and blue, exit lighthearted, carefree, and cured. No, seriously, this is one happy Liz boutique. Here are more dresses, and tomorrow it's Liz pants (Grey Gardens inspired ensemble), skirts (you've never seen such color), and hot granny tops (nobody does chic, modern granny like Isaac). Liz Claiborne, you have met your match and you must be one happy apparel company. 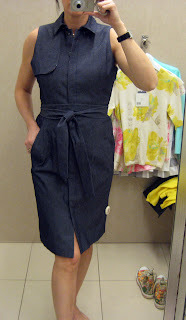 The denim dress ($119) I'm also obsessed with. 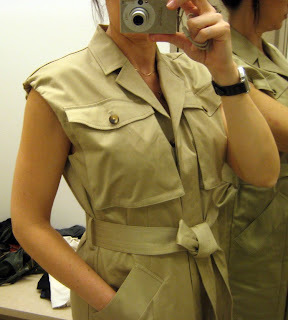 The khaki dress doesn't fit me as well, but don't let that stop you. It's a boxier cut. 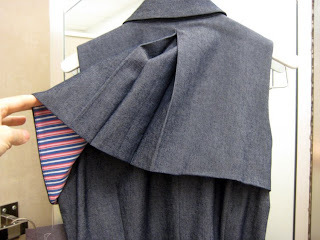 And check out that fabulous tucked, non-sleevish shoulder. la belette - isaac is doing Liz good! That denim dress is amazing!!! I would wear that all summer long! 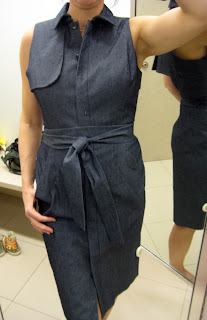 The denim dress detail is stunning but the blue one looks BEST on you. I hope you bought it!! hehe "nobody does chic, modern granny like Isaac", so true. I think I can c a fierce pair of pins your hiding underneath that shirt dress - I hope to see more of this spring. Hi there-the first dress is stunning on you, I love it!! Imelda, I'm blushing! um, maybe not this summer, perhaps once i'm a little tan? butterfly - i almost bought it on the spot but am on credit card freeze. lipstick - totally. It's such a great dress. sharon - thanks, that's what a great dress does, right?